In 1992, David enrolled in Drury University evening college, graduating in 1998 with a B.S. in Communication and an A.S. in English, after which time he became a newspaper advertising executive. In 2000, David enrolled in Drury Master’s in Communication program, while also working as the regional manager for a chain of video stores. After graduation, he began teaching as an adjunct at OTC in addition to Drury. David became a full-time OTC instructor in fall, 2005, teaching at the Springfield Campus, the former Branson Campus, and the former Ozark Campus. In 2007, he became the Communication Department Lead Instructor at the Richwood Valley Campus, being among the first instructors to teach at that location. 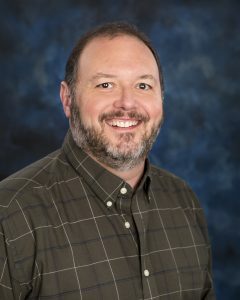 He is currently still a member of the Richwood Valley faculty team, but he remains involved with the entire department, particularly in the areas of assisting with online education and publisher-based digital learning platforms. David is a graduate of both Leadership OTC and the Chancellor’s Academy. He is also a recipient of the OTC Excellence in Education award, the Missouri Governor’s Excellence in Education award, and the National Institute for Staff and Organizational Development (NISOD) Excellence award.